Fabio Aru was injured, shocked and upset when he let fly at his bike after his Vuelta crash. Despite the circumstances, Ernesto Colnago is not happy with him. Italian bike brand Colnago has not taken kindly to Fabio Aru’s outburst live on TV after he crashed at the Vuelta. 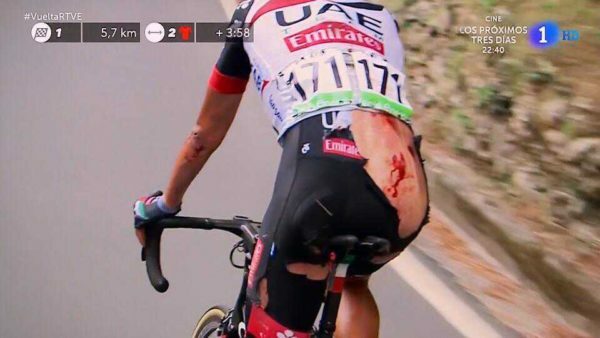 The UAE Team Emirates rider was clearly livid after crashing. And he could be seen and heard blaming his Colnago bike for his 70km per hour crash. In his defence, it was a very nasty fall at high speed. He looked shocked and was injured; his shorts almost completely ripped from his back and behind. And while Aru contacted Ernesto Colnago to apologise for his outburst and strong criticism of the bike, Colnago was still determined to have his say in the Italian media. “I’ve provided bikes to thousands of riders. And I’ve never been insulted live on TV that way,” he said of Aru’s outburst which was picked up in the TV coverage, below. “He called and apologised to me for fifteen minutes,” Colnago added in an interview with Italian newspaper La Gazzetta dello Sport. “I understand he’s having a difficult season. Everything is going wrong for him. But I explained that he’s a professional. Things will go his way eventually. According to his team, Aru said his chain became stuck in the 11. He put his hand down to move it to the 12. As he was looking down, he crashed. He fell on a downhill section with a deep storm drain and wall right beside him nearing the finish of stage 17. “I would like this to be an end to my bad luck in 2018,” he said of the crash in what has been a very difficult season for him. “I took an impact to my lower back, which worries me, as well as the pain. We were descending at 70km per hour. It could have been a lot worse. 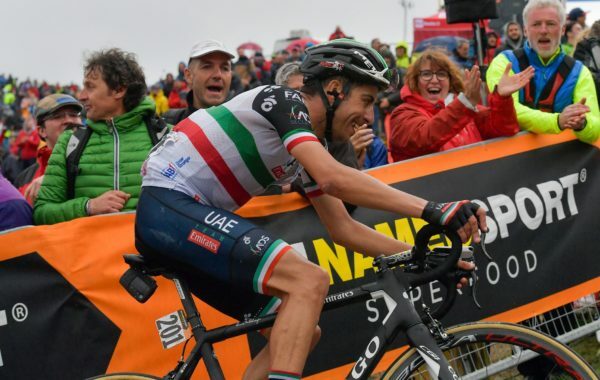 Fabio Aru transferred to UAE Team Emirates as a big signing last winter, with Dan Martin also joining. Martin enjoyed a very strong Tour de France; claiming 8th and winning a stage. For Aru, the 2018 season has been marked by poor form and bad luck.